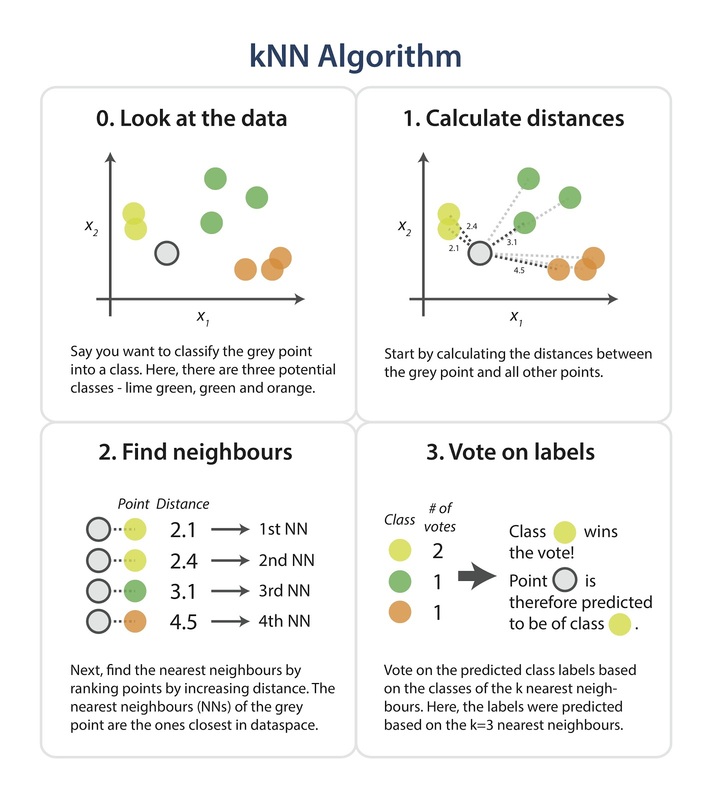 A detailed explanation of one of the most used machine learning algorithms, k-Nearest Neighbors, and its implementation from scratch in Python. Enhance your algorithmic understanding with this hands-on coding exercise. Editor's note: Natasha is active in the Cambridge Coding Academy, which is holding an upcoming Data Science Bootcamp in Python on 20-21 February 2016, where you can learn state-of-the-art machine learning techniques for real-world problems. The steps in the following diagram provide a high-level overview of the tasks you'll need to accomplish in your code. Briefly, you would like to build a script that, for each input that needs classification, searches through the entire training set for the k-most similar instances. The class labels of the most similar instances should then be summarised by majority voting and returned as predictions for the test cases. The complete code is at the end of the post. Now, let's go through the different parts separately and explain what they do. Loading the data and splitting into train and test sets To get up and running, you’ll use some helper functions: although we can download the iris data ourselves and use csv.reader to load it in, you can also quickly fetch the iris data straight from scikit-learn. Further, you can do a 60/40 train/test split using the train_test_split function, but you could have also randomly assigned the rows yourself (see this type of implementation here). 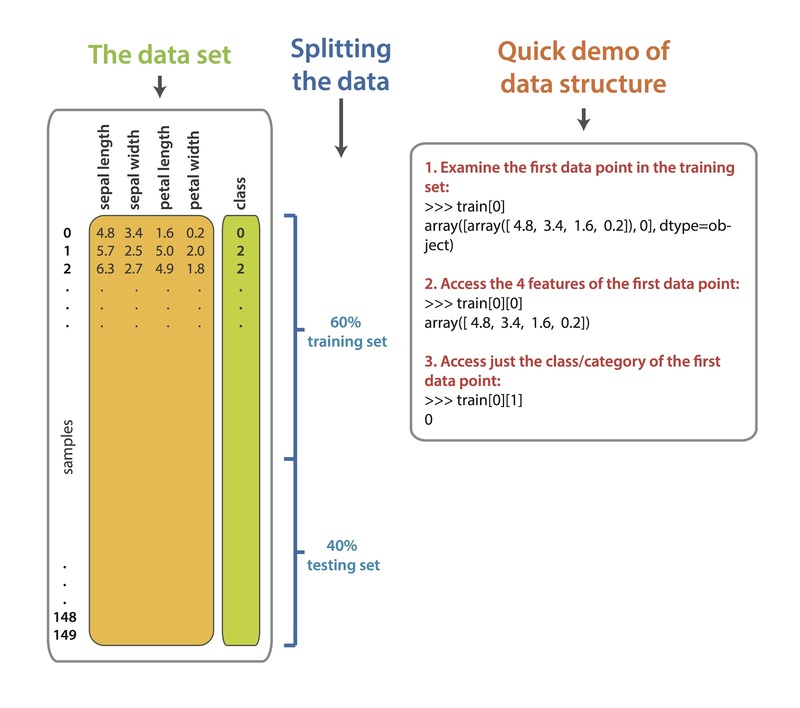 In machine learning, the train/test split is used in order to reduce overfitting - training models on the full dataset tends to lead to the model being overfitted to the noise and peculiarities of the data, rather than the real, underlying trend. You do any sort of model tuning (e.g. picking the number of neighbours, k) on the training set only - the test set acts as a stand-alone, untouched dataset that you use to test your final model performance on. Here is an overview of the iris dataset, the data split, and a quick guide to the indexing.